Everyone loves Gulf Place Beach. This beach features plenty of things to do including sandy beach bars, eateries, beach boutique stores, pavilions, picnic areas, volleyball, watersports and beach hotels that let you stay and play. Highway 59 dead-ends at the main beach area, but there is public access up and down the coast. 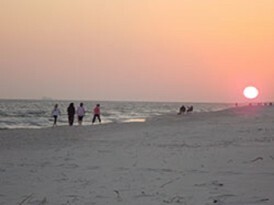 Gulf State Park offers a whirl of activities including boating, paddle boarding, fishing, from the Gulf State Park Pier, biking, golfing and camping. There’s even a play area just for dogs located at Lake Shelby on the park’s western end. 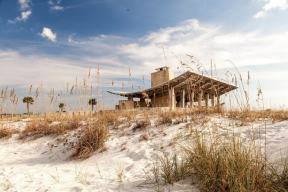 From the main entrance at the Beach Pavilion in Gulf Shores, there are access points along Orange Beach (including Alabama Point East). 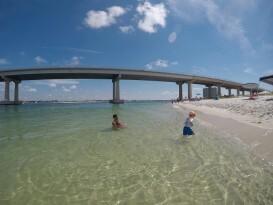 Cotton Bayou is set at the intersection of Highways 182 and 161 in Orange Beach and also part of Gulf State Park. Cotton Bayou is small in size but big on amenities, including outdoor showers and ample free parking. 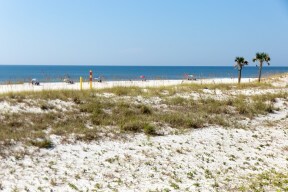 This beach is located within convenient walking distance of the primary Orange Beach condominiums. Some beach goers plant their towels, open a good book and start working on the ultimate tan. Others like to stir things up with parasailing, kayaking and excursions to nearby islands. 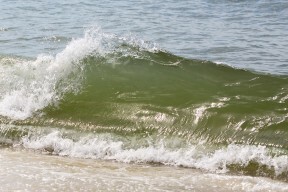 If you’re staying close to shore, a flood of beach equipment rentals will be on hand – beach bikes, buggies, beach wheelchairs, paddle boards, surf and skim boards and all kinds of flotation devices. Many companies offer delivery and pick-up service. 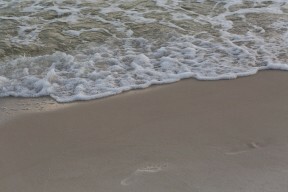 You can get too much of a good thing, so don’t forget the sunscreen before venturing out in the warm Alabama sunshine. Take care when exploring the sand. You might happen upon a sea turtle nest or a tiny bird’s nest. Keep off the dunes, dude. They preserve natural habitats. 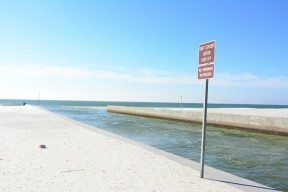 Beach boardwalks and walkovers are plentiful and will get you to the shore. Take nothing but pictures and leave only footprints. 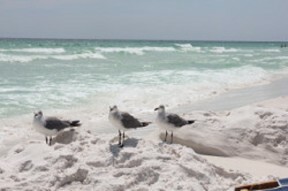 Clean up after yourself and don’t forget your beach chairs and towels. 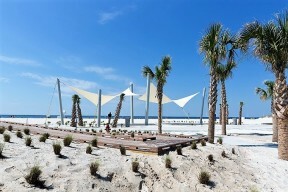 Ready to take a trip to Alabama's Gulf Coast this season? 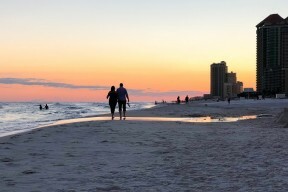 Download the Gulf Shores vacation guide and start planning your next adventure today!